Penguins are noisy, as any visitor to an aquarium knows. Penguins may be noisy in others ways too, according to a new study published in Nature Communications. Scientists have long used Adélie penguin populations to monitor the health of the Southern Ocean and to understand how major factors such as fishing and climate change impact the oceans and the animals that rely on them. Now an extensive analysis of all known data on Adélie penguin populations over the last 35 years has found that only a small fraction of year-to-year changes in Adélie penguin populations can be attributed to measureable factors such as changes in sea ice. Instead, most of the short term fluctuations in the number of penguins breeding has no known cause; such 'noise' in the system is likely due to a host of marine and terrestrial factors that have not, or cannot, be measured at the majority of sites where penguins breed. 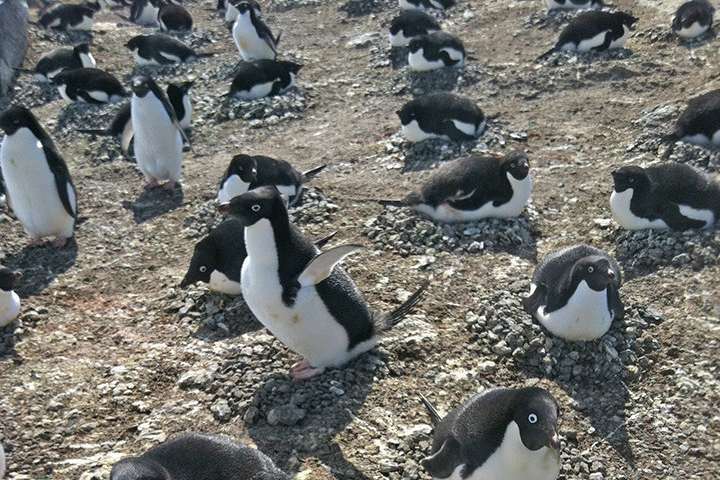 "In many ways, our study shows that watching Adélie penguin abundance may be like watching the stock market—short term fluctuations may be exceptionally hard to predict and may not signal any change in the fundamental health of the system," explains senior author Heather Lynch, Associate Professor of Ecology & Evolution at Stony Brook University. "Therefore, adaptive management of marine resources, whereby we stand 'at the ready' to adjust our conservation strategy as new data are collected, may be as difficult, and as risky, as trying to time the stock market. Instead, our results suggest that to the extent Adélie penguins are used as a barometer of ecosystem health, the true dynamics may emerge only very slowly." This finding, detailed in the paper "Pan-Antarctic analysis aggregating spatial elements of Adélie penguin abundance reveals robust dynamics despite stochastic noise," is important because it means that tracking abundance at individual colonies, one of the cornerstones of monitoring the health of the Antarctic ecosystem, may not provide a reliable signal on short time scales. "By analyzing the data, we found that relatively little of the year-to-year variability in Adélie penguin abundance could be linked to something in the environment we can actually measure," said lead author Dr. Christian Che-Castaldo, a postdoctoral researcher in the Department of Ecology & Evolution at Stony Brook University. "Precipitation at the site is one factor we know is likely to drive some of this unexplained variation, but like many other potential factors, it's not one we can easily measure in Antarctica." "This doesn't mean that monitoring isn't important, only that we may have to adopt an even more conservative strategy for conserving marine resources. In the face of so much uncertainty, we may not detect a real decline until it's already too late," Dr. Lynch explained. Adélie penguins are one of four species of penguins with significant breeding populations in the Antarctic. Adélie penguins are the most well studied of all penguin species and, being distributed around the entire coastline of the Antarctic continent, are often considered the "canaries in the coal mine" for anthropogenic threats like fishing and climate change. They used a statistical technique known as hierarchical Bayesian modelling to accommodate the fact that most Adélie penguin breeding locations are surveyed only rarely. Finding a statistically-rigorous way to 'fill in' missing data was key to the effort, since it allowed the research team to look at the population dynamics of penguins at larger spatial scales than has been possible in the past. "The findings, overall, provide clear guidance on how to extract the most information from our monitoring efforts, and highlight the benefits of working across disciplines for effective conservation," added co-author Dr. Jenouvrier at WHOI.